Beiqi insists on the acquisition of Changhe, and its strategic considerations are: first, product lines complement each other; second, strong regional complementarity; and third, it is beneficial for BAIC to become bigger and stronger. Together with several other "big shots" of Beiqi in recent years, behind its mad expansion, it is the Beijing Municipal Government's hope that BAIC will hit the industry's first echelon. Under the general trend of enhancing the current positive R&D strength, it is still doubtful whether Beiqiâ€™s â€œgreat for greedâ€ approach can take a good and long-term approach. "By 2020, a total of 27 billion yuan will be invested in Changhe Motors to build a complete automotive industry chain." This is the "marriage commitment" given by Beijing Automotive Group to Changhe. In recent days, BAIC signed an agreement with Jiangxi State Control (the state-owned sole proprietorship of the Jiangxi Provincial State-owned Assets Supervision and Administration Commission), the actual control agency of the current Changhe, to formally locate Changhe, which is independent of Changâ€™an Auto in October this year. An important strategic base in southeastern China. 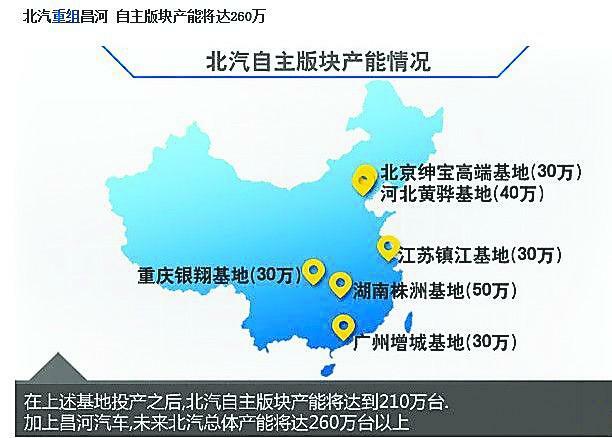 According to statistics, this â€œkick-offâ€ is the third expansion project completed by BAIC this year. In the past four years, BAIC has completed seven â€œstakingâ€ projects in China. Such radical expansion can not help but think of the year. FAW Group and Changan Group. However, this has also caused many industry insiders to worry about it. A senior expert, who declined to be named, told this newspaper that in todayâ€™s trend of self-owned companies gathering to enhance their technology and brand power, they even do not hesitate to do a subtraction. The "disposal" behavior is no longer appropriate. "Although there is a willingness behind the government, BAIC is still in danger of 'digestion' based on its own conditions." The 100 billion goal "looks beautiful"
Before the "marriage of the bride", the man naturally has to give the woman a gift. In this agreement between Beiqi and Jiangxi State Control, Beiqi will provide 80 million yuan in â€œgift giftsâ€ and purchase 70% of Changheâ€™s shares from Jiangxi State Control ( Jiangxi Provincial State-owned Assets Supervision and Administration Commissionâ€™s assessment of Changheâ€™s net assets is RMB117 million. Yuan), another 30% is still held by Jiangxi State Control. This time Changheâ€™s â€œTwo Marriageâ€ had lost the operating and management dominance of Changâ€™an and had not received Changâ€™anâ€™s model and technical support. Even Changâ€™an produced Changâ€™an Mazdaâ€™s transfer of Changheâ€™s production qualification. Requested independence, and in October this year after the approval of the SASAC, successfully separated from Chang'an, in addition to Hefei base, all assets belong to the Jiangxi state-controlled. Beiqi saw this point. In the negotiations with Jiangxi State Control, it first promised that the four â€œunchangedâ€, that is, the reorganized Xinchanghe Company will maintain its legal status, the main business entity will remain unchanged, and its production base will remain unchanged. Changhe brand does not change. In other words, the main management, technology and development of the reorganized company still rely on the employees of Changhe Automobile. BAIC only dispatches sales and financial representatives to participate in the business of Changhe in the future. This is not the case in Changan. Another background is that due to the lack of new product support from Changan and its joint venture partner, Japan Suzuki, in recent years, and its lack of R&D capabilities, Changheâ€™s operating conditions are declining. The data shows that in 2010, annual sales of Changhe Automotive were 180,000 units; in 2011, it was down 33.3% year-on-year to 120,000 units; in 2012, it continued to fall to 113,000 units. In the first 10 months of this year, the sales volume was 78,700 units, down 12.74% year-on-year, and the main product was a single product (Big Dipper accounted for 80% of its sales volume). After the completion of the acquisition of Changhe and other projects, BAIC will not only have variables in the introduction of new products and cooperation, but will also face more pressure in the future investment funds and financial status. According to statistics, in recent years, the total investment of some of the national expansion projects announced by Beiqi has reached nearly 60 billion yuan. The East China Base has settled in Zhenjiang City, Jiangsu Province, with a planned total investment of 15 billion yuan. The Beiqi Yunnan Industrial Base project has a total investment of 3.6 billion yuan; the investment in Yunnan, Chongqing, and Guangdong is about 20 billion yuan; the Changhe project is also 20 billion yuan. Yuan above. According to media reports, in January next year, BAIC will, together with Jiangxi State Control, inject the first capital of RMB 1 billion into Changhe. However, people familiar with the matter disclosed to the newspaper that due to Chang'an, Changhe has few profits in recent years, and the debt-to-equity ratio is relatively high. Beiqiâ€™s initial investment will be mainly used for debt repayment. This is similar to Chang'an's investment in Changhe. In 2011, Changan raised RMB 1.5 billion, half of which was used to repay Hafei and Changhe bank loans. "If BAIC's initial investment in Changhe is also mainly to repay its debt, it will add another boost to Beiqi's liabilities due to its expansion." A person familiar with BAIC's financing process told this newspaper. According to the reporter's â€œBeiqi Automobile Group Co., Ltd. monthly financial reportâ€ (January-September 2012) provided by this person, the total liabilities of Beiqi at the beginning of 2012 were 45,523 million yuan, and by September 2012, it reached 535.02. Billion yuan, the debt surged 8 billion yuan in 9 months. Although it did not get updated data, considering the later new acquisitions, BAIC's current total liabilities are only not lower than the figures for September 2012. Facing the future high debt and high investment, how does Beiqi solve it? Some insiders believe that perhaps Brilliance's experience can be used as a reference for Beiqi. In that year, Brilliance spun off loss-making Chinese brands from Hong Kong-listed companies, and later used Brilliance China, which owns high-quality assets such as Brilliance BMW, to conduct multiple financings to provide development funds for independent businesses such as Chinese brands. Currently, Beiqi Co., Ltd., which owns Beijing Hyundai and Beijing Benz and Saab, E-Series's own business, will soon land on the H-shares. Perhaps it will use capital financing in the future to increase its basic R&D capabilities and benefit independent businesses outside the listed companies. To this end, Beiqi promised to jointly invest RMB 13 billion with Jiangxi State Control Corporation in 2014~2017 to realize the annual production and sales of 500,000 complete vehicles in Changhe, and the annual operating income of the entire industry chain will be RMB 50 billion, which will drive automobile service trade and autos. The rapid development of the financial industry; By the end of 2020, BAIC will accumulatively invest a further 14 billion yuan in the entire industrial chain in Jiangxi to further expand its industrial scale, establish a new joint venture base and a strategic base for its own brands, and ensure the realization of the â€œMillions of billionsâ€ in Jiangxi Changhe. The target is to produce and sell 1 million complete vehicles and realize 100 billion yuan in operating income in the entire industry chain. Although five years ago, because of the SASAC "paid" Changan to reorganize Changhe, Beijing Automobile missed the acquisition opportunity, but Beiqi chairman Xu Heyi still has a strategic consideration in his persistent acquisition of Changhe: First, the product lines are complementary. The company has more products with a displacement of 1.4 liters or more, and most of Changhe is a small displacement of less than 1.4 liters. There is no conflict between the two. Second, regional complementarity. In the past, BAIC's major markets and network channels were more north and south, and the acquisition of Changhe could expand BAIC's southern markets. Third, Beiqi is conducive to the goal of becoming bigger and stronger. However, after Beiqi entered the Changhe River, Zhang Xiyong, the general manager of Beiqi Automobile, made an interesting statement, that is, â€œBeijing Municipal Governmentâ€™s demand for BAIC is to enter the industryâ€™s first echelon as soon as possibleâ€. Obviously, Beijing Automobile's acquisition of Changhe hides the strong expectations of the government. At present, in the ranking of large-scale state-owned auto groups in China, Chang'an Group and BAIC rank fourth and fifth respectively. In the performance of the market in the first ten months of this year, Chang'an Group sold 1.8371 million units and BAIC sold 1.647 million units. The gap between the two is only 183,300. Now Changhe, which was previously affiliated with Changan, has acquired challenges and even surpassed Chang'an Group's strength. However, even if it is the will of the government, it is difficult for Beiqi to avoid the dilemma of starting its own business. It is understood that in the independent business owned by the Group, with the exception of the outstanding performance of Futian Commercial Vehicles, the remaining brands have not performed well in their respective fields, and in particular, the number of passenger vehicles has remained below 6,000 for months. However, BAIC promised Changhe that the reorganized Jiangxi Changhe will introduce the Beiqi Group's dual-brand platform models. The products range from B-class vehicles to mini-vehicles, from cars to SUVs and MPVs. â€œNot only for Changhe, but also for Beiqiâ€™s acquisition or self-building projects, it has promises to introduce new products and new technologies to the local government, but it is difficult to match such expansion based on BAICâ€™s current R&D capabilities and product strength. And the cooperation with Suzuki must be resolved. This has brought great uncertainty to the effect of BAIC's scale development.â€ The above experts pointed out. Changan, on the other hand, has given up its arrogant and aggressive strategy expansion three years ago. Now, with its self-directed development system in the past two years, its own brand performance is remarkable. Even insiders from Chang'an also acknowledged to this newspaper that reorganization involves energy, and the results obtained by self-effort are fast and steady. Sock Boarding Machine is the machine, which inside of the cabinet, there is a device producing steam in vacuum condition according to production requirement to iron socks. Box type sock boarding machine is usually applied in small or medium scale sock production unit for its economic cost, easy operation, energy saving. For large scale sock production unit, rotary sock boarding machine can meet the requirement, it is recommended for quality socks boarding. Previous: What is the prospect of the domestic tool market?